If you have lost of of these whilst skating, you have our deepest sympathies as we know exactly how much it hurts! A pack of four replacement axle nuts, these will fit any longboard or skateboard truck out there (apart from some brands of precision truck that use a metric thread - if you're not sure, give us a call). 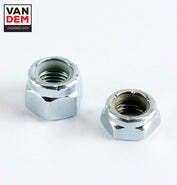 The nut spec is 5/16" with a 24TPI UNF thread, and you'll need a 1/2" socket to do them up.